April 10, 2014 - Bombardier Aerospace announced that the Learjet 85 aircraft successfully completed its first flight, achieving a major milestone in a business aircraft development program that will redefine the midsize segment. 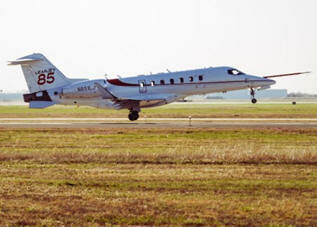 This first flight marks the start of the Learjet 85 aircraft’s flight test program leading up to the first customer delivery. Bombardier employees along with suppliers were on hand at the Bombardier Wichita facility to celebrate this milestone flight and greet the Learjet 85 aircraft and test flight crew upon landing. “Today marks a significant accomplishment for the Learjet 85 team. The aircraft performed very well. I would like to congratulate all the employees who have played a role in achieving FTV1’s maiden flight,” added Ralph Acs, Vice President and General Manager, Learjet 85 program. With a customer-driven clean-sheet design, the Learjet 85 aircraft will be the largest, fastest and most capable Learjet aircraft ever. True to its legendary heritage, the Learjet 85 aircraft is set to deliver the extraordinary performance, superior technology and exceptional value Learjet aircraft owners expect. The jet is powered by two Pratt & Whitney Canada PW307B engines, each boasting 6,100 pounds of take-off thrust at sea level up to 86ºF (30ºC) and low noise levels, while the advanced low NOx emitting combustor offers reduced environmental impact. The aircraft targets a high-speed cruise of Mach 0.82 and a transcontinental range of approximately 3,000 nautical miles (5,556 km).